Appointed by Governor Henry C. Stuart on October 24, 1916, to fill the vacancy created by the resignation of Richard Henry Cardwell and began his service on December 16, 1916. First elected by the General Assembly on January 16, 1918, to complete the unexpired term of Cardwell. Elected on February 2, 1922, to a 12-year term beginning February 1, 1923. Service terminated by death. Elected president on March 10, 1925, to fill the vacancy created by the death of Frederick Wilmer Sims. Became the first chief justice in 1928, when amendments to the constitution changed the title from president to chief justice. Service terminated by death. Appointed, Cardwell Resigns, Prentis is Named as his Successor, Richmond Times-Dispatch (Richmond, Va.), October 25, 1916, col. 7, retrieved on February 24, 2014; qualified, 120 Va., iii; first elected, Journal of the Senate of Virginia, 1918 Session, 66; elected to a 12-year term, Journal of the House of Delegates, 1922 Session, 197; elected president, 141 Va., iii; title changed to chief justice, Thomas R. Morris, The Virginia Supreme Court: An Institutional and Political Analysis (Charlottesville: University Press of Virginia, 1975), 64; birth, death, education, and career, transcript of memorial and portrait presentation, undated, published in 157 Va., v-xi; law degree, “Robert Riddick Prentis, Chief Justice, Virginia Supreme Court of Appeals,” Notable Alumni, University of Virginia School of Law web site, retrieved on April 28, 2014; service on State Corporation Commission, Prentis Again Named Member of Commission, Richmond Times-Dispatch, January 7, 1916, col. 2, retrieved on February 24, 2014; portrait, Ray O. Hummel, Jr., and Katherine M. Smith, Portraits and Statuary of Virginians Owned by the Virginia State Library, the Medical College of Virginia, the Virginia Museum of Fine Arts, and Other State Agencies (Richmond, Va.: The Virginia State Library, 1977), 97. In 1929, the Virginia State Bar Association formed a committee to acquire portraits of former justices who were not already represented in the court’s collection and approved a measure to reduce the cost of the project by asking family members of the justice to donate a portrait. 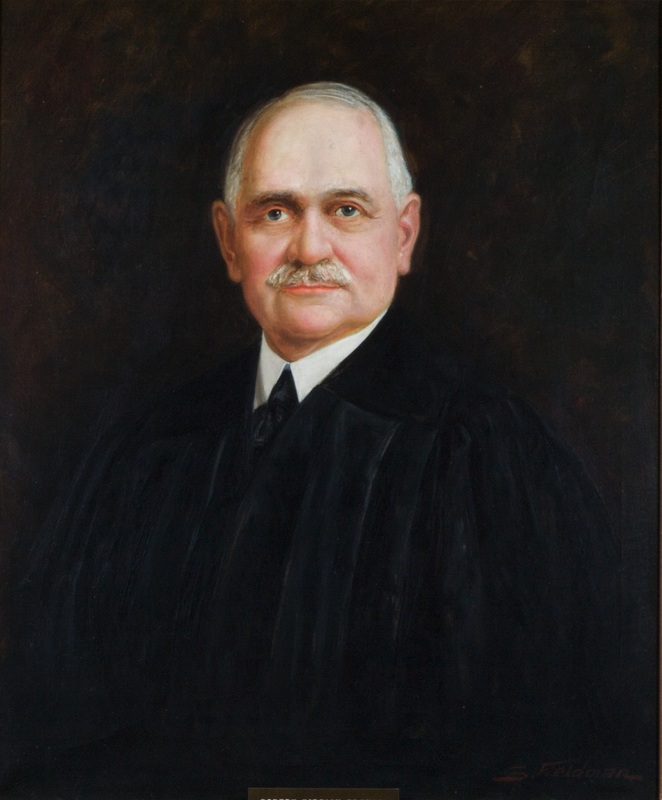 Prentis’ portrait was donated by family members in 1932 in response to this request; see Proceedings of the Fortieth Annual Meeting of the Virginia State Bar Association, August 1929, 206-210; and Proceedings…August 1932, 108.